Lizzie Velasquez may be small, but she is definitely mighty. We throw that word "hero" around a lot these days. But this is one person who truly deserves it. Lizzie was born four weeks premature with a rare congenital disease that prevents her from accumulating body fat. Basically, she can't gain any weight. She also suffers from blindness in her right eye and Marfan syndrome. She's never weighed more than 65 pounds. Due to her looking "different" she was severely bullied through her childhood. In 2006, when she was just 17, Lizzie Velasquez was declared the “World’s Ugliest Woman” in a cruel YouTube video. It was something that could have destroyed a person. But Lizzie didn't coward down. She didn't let those bullies win. She kept her head held high and turned all the negativity in her life into positivity by not letting these insatiable bullies break her. She went on to major in communication studies at Texas State University and became an anti-bullying public speaker. She also released her three books, Lizzie Beautiful: The Lizzie Velásquez Story and two others directed toward teenagers facing obstacles. Her newest book, Dare to be Kind comes out this summer. 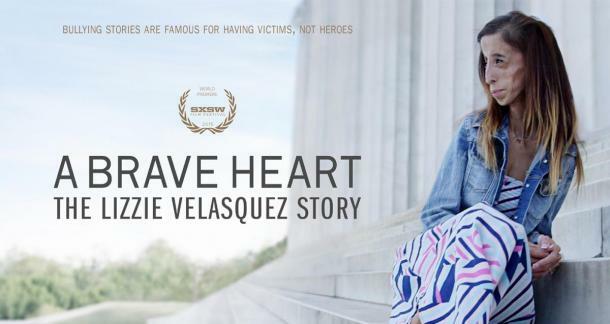 Her story has inspired so many that it was turned into a documentary titled A Brave Heart: The Lizzie Velásquez Story, which premiered at South By Southwest in 2015. Lizzie credits her Roman Catholic faith with helping keep her strong. “It’s been my rock through everything, just having the time to be alone and pray and talk to God and know that He’s there for me," she told Charisma News. And for those who are being bullied right now: You can NOT let them break you. Remember there is always a light at the end of the tunnel. You will get through this, you are not alone. You are loved. Stay strong. You can follow Lizzie Velazquez on Twitter at: @littlelizziev, Instagram: @littlelizziev ,Youtube: Lizzie Chickita, and Facebook: Lizzie Velasquez. We have compiled 10 quotes from Lizzie that inspire us to stand up to those who try to break us down. Light up your own world! You are stunning! Own it! Keep you head held high! You have the world in your hands! Dance off the bad vibes!